You’ve probably never paid much attention to the direction in which your screen door swings – to whether it swings inwards, towards the interior of your home, our outward, towards its exterior. However, surprisingly enough, which way your screen door swings can be very important. 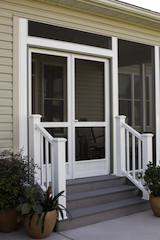 Here’s why: though the vast majority of screen doors are “out-swing,” there are certain circumstances in which an “in-swing” screen door may be preferable or even necessary. For example, building codes in some areas require that screen doors be in-swing rather than out-swing. And, when considering how to hang a door over steps, choosing the right swing direction is a crucial safety concern. A door that swings over a flight of steps is a hazard since anyone who leans on it when it’s unsecured is liable to tumble down the steps and injure themselves. And someone standing on those steps and opening an out-swing door could topple over backward. So, how to hang a screen door over stairs is extremely important and, if you have a flight of stairs directly outside your screen door, you’ll absolutely need to make sure it swings in rather than out. Finally, even when there are no relevant building code or safety considerations at play, you may simply prefer an in-swing screen door to the standard out-swing one for reasons of your own. 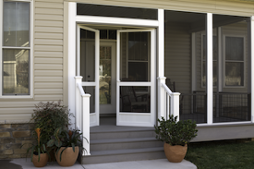 Whatever your reasons, getting your screen door to swing in rather than out might seem simple. All it seems like you’d need to do is install it turned around facing inward. But, unfortunately, this won’t work. The problem is that your door would now be backwards – the lock would be on its outside and the closer tube on its inside. The outswing hardware that comes standard with most screen doors simply won’t allow the lock and closer tube to be on the correct sides when you want your door to swing in. However, at PCA we’ve come up with a solution to this problem with our Albright In-swing handle and tube bracket kit. It comes with both an in-swing handle and an in-swing closer tube, allowing you to put each on the correct side of your in-swing screen door. So, if you find yourself needing, or even just wanting, a screen door that swings in, our unique Albright Kit comes with the necessary in-swing hardware to let you install your door the way you want and still have everything on its correct side.